This is inspired by a recipe I learned in college, though it’s run far afield since then. I was an international studies student then, was learning Arabic and Spanish, and had a lot of friends from around the world. Fairly often the International House, the center of international student and International Studies student social life, would have a potluck. They also had a big dinner fundraiser for which I helped make 1500 gyoza and 1200 krumkake in two of the most mind-numbing days of my life. But that’s another story for another day. One of the things at least or or two or three Arab students would bring was kabsa. And every kabsa was different. I learned how to make it and decided it was perhaps the easiest thing in the world to make. Now this is not going to be a traditional recipe because that’s the thing with kabsa, you make it what you want it to be. The first thing is you heat your oven to 350° F. While it’s heating up, you put a baking dish on a medium high burner with a tbsp of olive oil. In the olive oil, you put about 1/4 tsp or so of an aromatic spice like nutmeg, cardamom, anise, allspice, cinnamon. The heat releases the oils and flavors the oil which is going to make everything wonderful. For today’s dish, I used 1/4 tsp of anise and a few shakes of red pepper flakes. Then toss in a piece of meat – a chicken breast, 1/2 pound of ground beef, or some stew meat cut into good sized pieces, at least 1 inch square. I went far astray and used carnitas–which means I can’t really call this kabsa, because no Muslim would be using pork. You want to brown the meat. While the meat is browning, cut up some vegetables into big chunks. No need to be dainty. For this one, I cut an onion into 8 wedges, crushed a couple cloves of garlic, cut some asparagus stalks into thirds, and chopped up two inch long pieces of red chard stalks and fennel stalks. After the meat was browned, I tossed in all the veggies. I tossed salad tomatoes in whole and cut a lemon into quarters. The lemon is not required, but it sure makes it delightful. I just dump everything in, then I made a dip in the center, put one cup of rice there, added two cups of water. Now, if I were using chicken, I might add some turmeric here, but not for pork. The raw rice, veggies, meat, and lemon – ready to get baked. 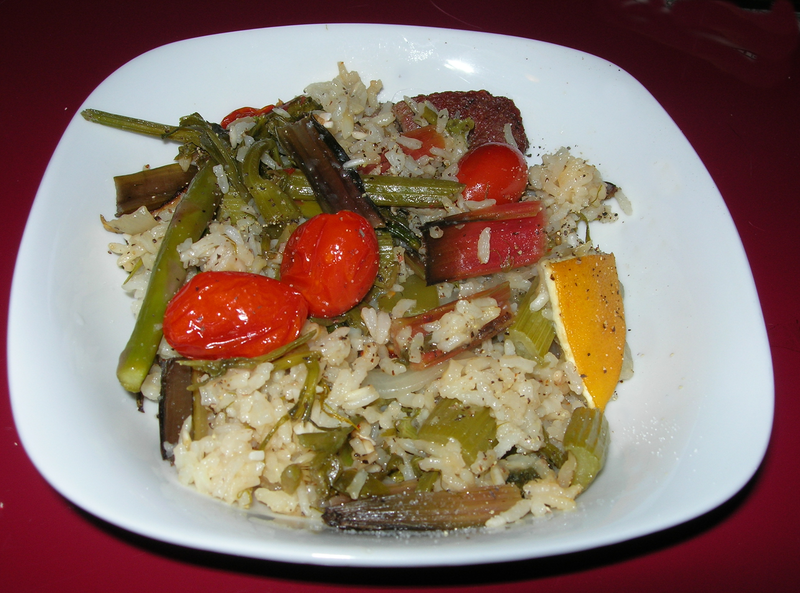 Okay, so to recap, aromatic spiece, browned bits of meat, big chunks of veggies, 1 cup rice, two cups water. That’s all you need, takes less than 10 minutes. Now you stick in the 350° and come back in 30 minutes and it’s done. No stirring, no messing with it, all in one pot. What could be easier? The rice will be perfectly cooked. The large cuts of veggies keeps them from overcooking. Brownign the meat keeps the meat juicy and tender. It will taste not tasted boiled! The aromatic spice adds depth and the lemon wedges infuse the entire dish with a subtle, light lemony flavor. This makes four servings, that get better with every meal. I really love a good open-faced sandwich, I suppose it’s my Swedish heritage and the tradition of smörgås. Two slices usually seems like too much bread, unless I use so much filling it’s unwieldy. I also have the Swedish yen for rye bread over all others. WinCo had fresh rye bread on sale for just $1.78 a loaf the other day. Who could resist? So, I put 1 tsp of saved bacon fat but you could use butter or olive oil in a small skillet on medium heat and added 2 TBSP of chopped onion, salt, and pepper and cooked until tender. Meanwhile I removed the casing from 3 breakfast sausage links, but you could just measure out 3 ounces of breakfast sausage if you don’t buy it in links. I added the sausage, breaking it up into small pieces with a fork. While the sausage was cooking, I sliced one mushroom in very thin slices. I put a griddle on and started heating it to medium. I put a small sauce pan on and heated to medium high with 2 tsp of olive oil. I added one clove of garlic (minced), shook in a few red pepper flakes and tossed in 8 whole grape tomatoes. I want the tomatoes to blacken a bit, so I shake them only to keep them from burning. On the griddle, I laid down two slices of rye bread, buttered on one side and placed buttered side down. I sliced very thin slices of Havarti cheese and placed on both slices to melt while the bread toasted. I chopped 2 TBSP of fresh fennel fronds and tossed into the sausage and mushrooms. I cooked some fennel the other night and saved the tops knowing they are a delicious addition to anything with tomatoes. I cut the top fifth off a fresh lemon and squeezed about 1 TBSP of lemon juice into the tomatoes, stirred and added the tomato sauce to the pan with the sausage, mushrooms and fennel. Meanwhile, I poached 2 eggs in the microwave, breaking each into a tbsp of water in a plastic egg poacher. Poaching takes about 40 seconds for 2 eggs. Everything should be ready together. 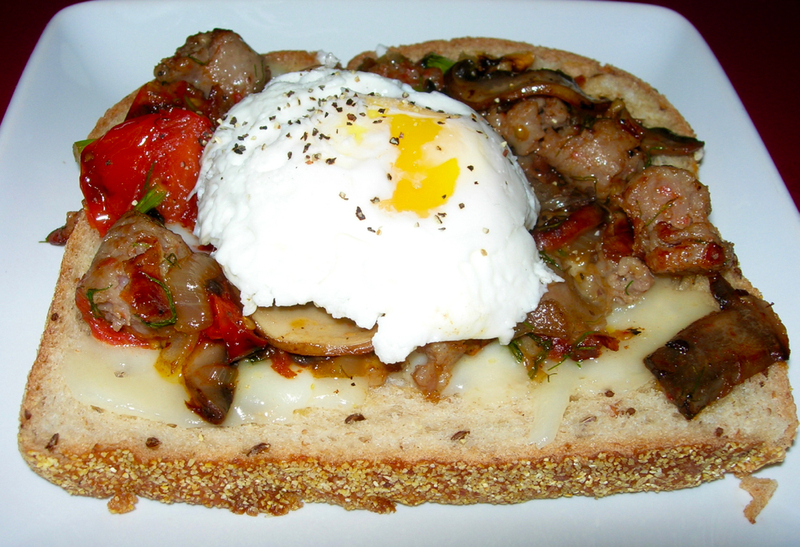 I spread the sausage, mushroom, and tomato blend on top of both slices of bread. Then placed one egg on each slice. I love slaw on my sandwiches. I love the freshness it brings, the crunch, the tang of vinegar. It is what really makes a sandwich. I generally just throw a few things together without hard and fast rules. There is no wrong way to make a slaw, but this slaw is kind of perfect. I use seasoned rice vinegar which is one of my favorite things. I mixed these together. Then I squeezed the lemon and added the juice with an equal amount of seasoned rice vinegar, some pepper, and 1 TBSP of olive oil. It should have enough salt from the salting the night before. Season it to your taste. I know the usual ratio in dressing is 2:1 oil to vinegar and this is the opposite, but this makes it tangy. 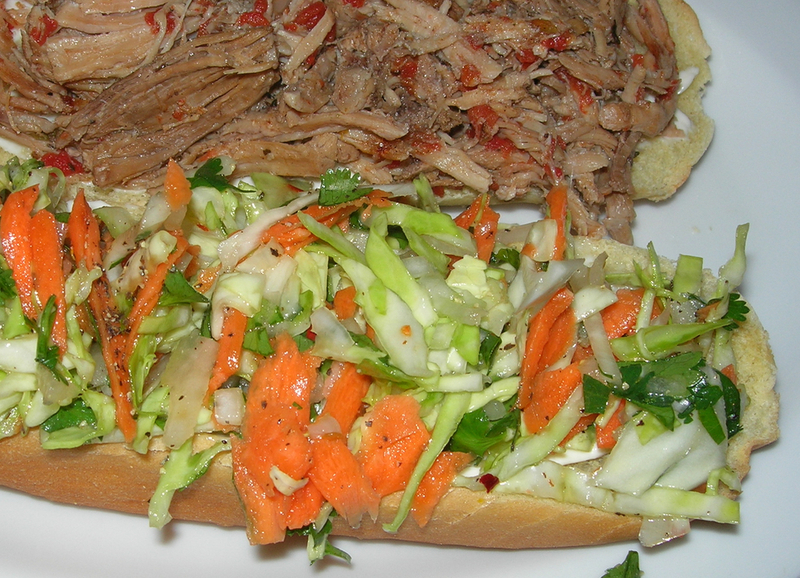 It doesn’t exactly pickle the slaw, but it gives it a light, bright, zing that I want. This makes enough for six sandwiches, more or less, depending on how much you like to use. I use this with bacon, sausage, or in this example, pulled pork. It makes a perfect sandwich or on a tostada shell, a delightful, fresh tostada. One of my favorite things about English Muffins is that they are the perfect size to hold one egg in a sandwich. An easy breakfast can be made by toasting an English Muffin and cooking an egg your favorite way. For me, I like a fried egg best, so that’s what I make. But what about adding a little extra to your sandwich. In the sandwich I made yesterday, I put some butter down on a medium cast iron skillet. 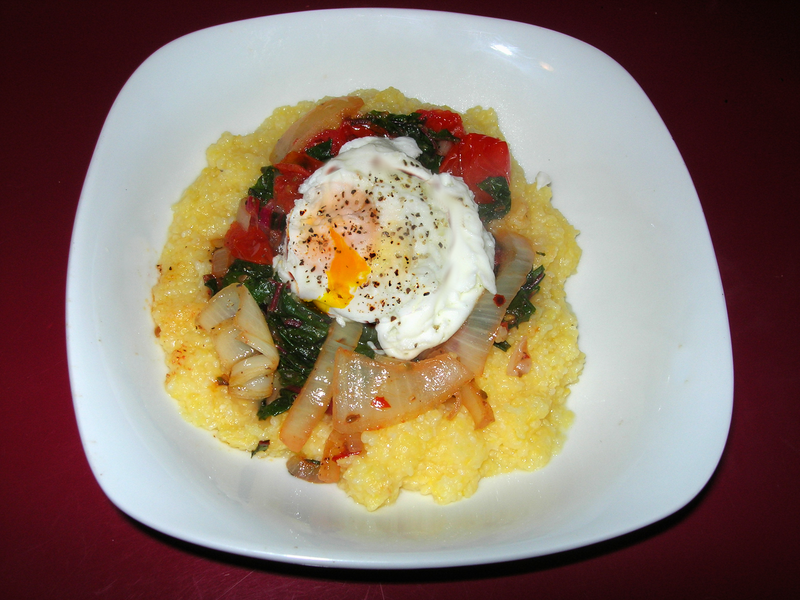 I cooked my egg in the center, on one side, I cooked a small handful of spinach. On the other side, I toasted the English muffin, melting some thinly sliced Havarti cheese on it. Put the muffins on first, then the egg, then the spinach. To keep the egg from spreading out too far, I put it in a metal one cup measuring cup and flip it on the griddle, leaving the cup in place. It holds the egg in place pretty well. You can also cut both ends off a can of tuna or cat food, and use it as a shaper to keep the size right. The creamy Havarti is a perfect complement to the umami of the spinach. This morning I made another sandwich. I started with the tomatoes first. I put 8 grape tomatoes in a small pan on medium. I did not add oil at first because I wanted a bit of char….it deepens the flavor and I always like a little char anyway. Meanwhile I heated my skillet for the egg, melting some butter in the center where I would cook it. When the first tomato burst, I put the egg on to cook with a dash of salt and pepper, put the English muffin in the toaster. Then I started to finish the tomato sauce. I added 2 tsp of olive oil, 1/4 tsp of red pepper flakes, salt, pepper, and then zested some lemon on top. When the muffin was done, I flipped the egg to cook the other side slightly, put it on the muffin. I then squeezed about 1 TBSP of lemon juice on the tomatoes and stirred. I spooned the cooked tomatoes on the other side of the muffin. It was delicious. The tomato sauce is rich in flavor, sweet with some heat and tartness and of course, the over easy egg added a creamy richness. Yum! Portobello mushrooms were just 1.99 per pound at the grocery store last week, so I picked up a couple, knowing how much I love them stuffed. Then I went and used the spinach I planned to stuff them with for something else and had this crazy idea I would try lima beans. I have some frozen lima beans from Harvest Share and thought why not? After all, lima beans are not super moist, so they might be great stuffing. I preheated the oven to 350° F while I mixed the following in a bowl. Mix all this together and stuff into the cleaned caps of two large portobello mushrooms. I had some left over, I will use it with scrambled eggs. You can shred some parmesan cheese on top if you like, but it’s not needed. Lima beans are a great choice for stuffing as they don’t lose their shape or substance when cooked, so the stuffing does not become overly mushy. All the ingredients in the stuffing were chosen to remain their constituent selves while holding together. They worked. The stuffing was completely cooked, but not the least bit soggy or mushy…thanks to draining off the sausage grease and using ingredients with low water content. Paprika seems to be made for mushrooms and works well, too with lima beans and sausage. This is a very satisfying meal that takes care of all your umami longings while remaining relatively light and fresh. 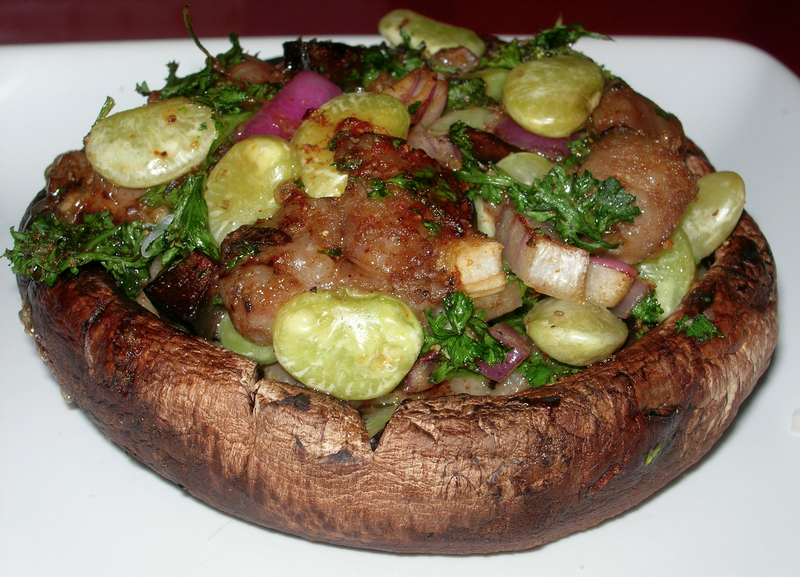 This makes two stuffed mushrooms which would serve two if accompanied by salad or soup, or one meal on their own. This was a delicious sandwich that took just minutes to make. Of course, I already had some pork roast in the fridge from supper the other night. I made Earl Grey roasted pork, but this would work with any good roast pork. For Earl Grey Roast Pork, preheat oven to 450° degrees. Pour 4 or 5 packets of Earl Grey tea ground for steeping and roll the pork roast in the tea, coating all sides lightly. Roast until 140° (about 30 minutes for a 1.5 pound roast) and let rest for 10 minutes before slicing. The roast for this sandwich, though, was cold, but it need not be. I took one hot dog bun. You could use a ciabatta or sourdough, too, but I used what came from Harvest Share. Spread some butter and sprinkle with garlic salt (or crush one clove of garlic and mix with the butter), slice parmesan cheese thinly and lay down on layer of parmesan, Put four stalks of fresh, young asparagus on each side and broil. Keep a close eye, you do not want it to burn. It took about 4 minutes to broil with the rack at the middle. 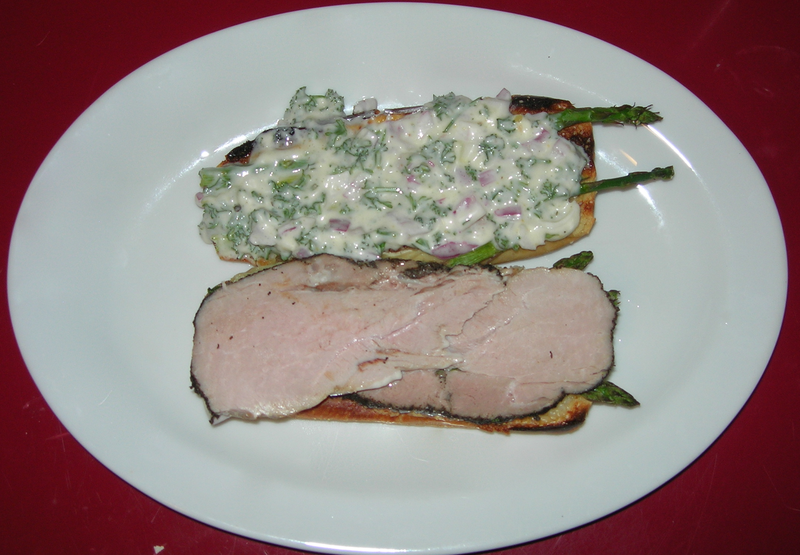 While the sandwich was broiling, I cut two slices of roast pork and mixed up a quick spread with chopped parsley, chopped red onion, and mayo in equal portions (about 1.5 TBSP of each) and seasoned with a bit of garlic salt and pepper. 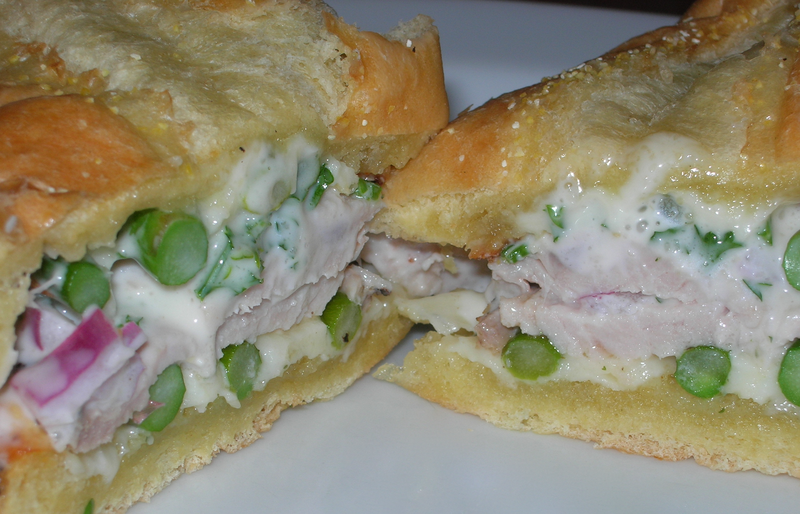 I spread it on one side, laid the pork on the other, put them together and had a delicious, fresh tasting sandwich. The mayo helped bind all the flavors together. I like the aromatic flavor of the Earl Grey pork, the bite of the onions, the fresh and tender asparagus and the earth grace notes from the parmesan and parsley. Wash and peel 1 pound of fresh, raw carrots. Cut into approximately 2 inch long pieces. Sprinkle with 2 teaspoons of olive oil and some kosher salt. Roast about 30 minutes, turning once so they brown a bit on both sides. About 15 minutes before the carrots are done, heat 1 TBSP of olive oil in the bottom of a soup kettle. Add 1 cup of chopped yellow onions, 2 bay leaves, salt and pepper and sauté until transparent, about five minutes. Crush two garlic cloves and toss in to the onions and sauté for a few more minutes. Add one can of diced tomatoes with green chiles and 4 cups of vegetable broth. Season with salt and pepper. Bring to a boil and then turn down to a simmer. 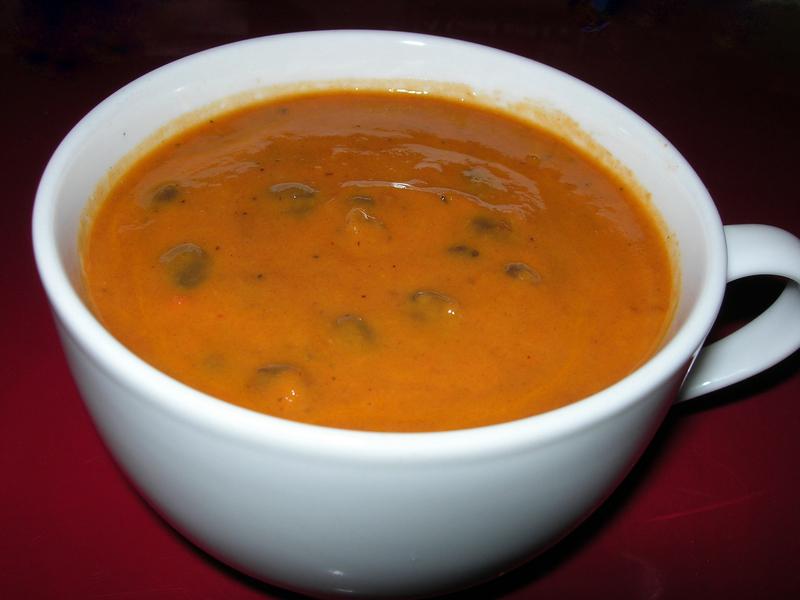 Remove the carrots from the oven and add to the soup. Cover and let simmer for 20 minutes. Cool and puree in a blender, Magic Bullet, or with an immersion blender until smooth. Drain 2 cans of cooked black beans. Strain and rinse the beans with water. Add to the soup and stir in gently. Cook on low heat about five minutes, until beans are done. Serve. You could top with parsley, if you have it. Cilantro or pumpkin seeds would be delicious, too. Some red pepper flakes would heat it up if you dare. You could also add a dollop of sour cream, but then it would not be vegan. Makes 10 cups of soup. This is a delicious blend of heat from the tomatoes and chiles and the rich, deep sweetness of the carrots with a bit of smokiness from the roasting. It’s delicious. Heat a cast iron skillet to medium with 1 TBSP of olive oil. Chop 2 TSBP of red onion and 2 of those baby yellow bell peppers. Add salt and pepper. Sauté until tender. On a cast iron griddle or pan on another burner, toast a sandwich bun. I toasted it dry without butter or oil. Meanwhile, cut one boneless chicken breast tenderloin into small pieces of about 1/2 inch square, salt and pepper. Add to the skillet and cook until done, (3 – 4 minutes), Add 1/2 cup chopped spinach or baby spinach, add a TBSP of mustard vinaigrette and put a lid on for two minutes to cook. While the veggies and chicken are finishing, cut two slices of tomato and grate a bit of parmesan cheese, just enough to sprinkle over the sandwich. To assemble, spread some mayo on the top side of the bun and place two thin slices of tomato. 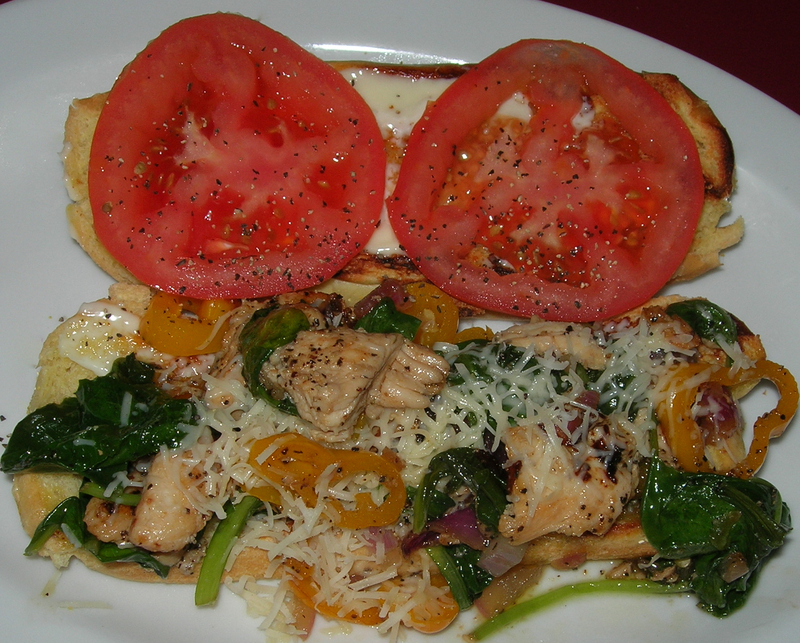 On the bottom side of the bun, spread your cooked veggies and chicken and sprinkle grated parmesan over it. 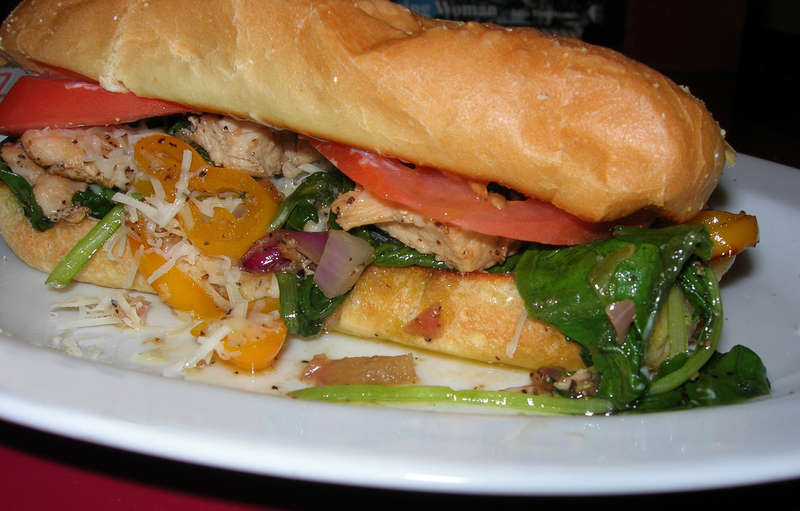 This was delicious, the blend of textures, the crispy coated bread, the gooey parm, the slight crunch of the peppers, with the tender spinach and the freshness of the tomatoes. The flavors are full of freshness and umami. I used only a small bit of parm, but it was just enough to be creamy. The mustard vinaigrette finished it off perfectly with a bit of tang and bite. I tossed some red chard with the Mustard Vinaigrette and let it rest, letting the vinaigrette “cook” it for about 15 minutes while I poached an egg. 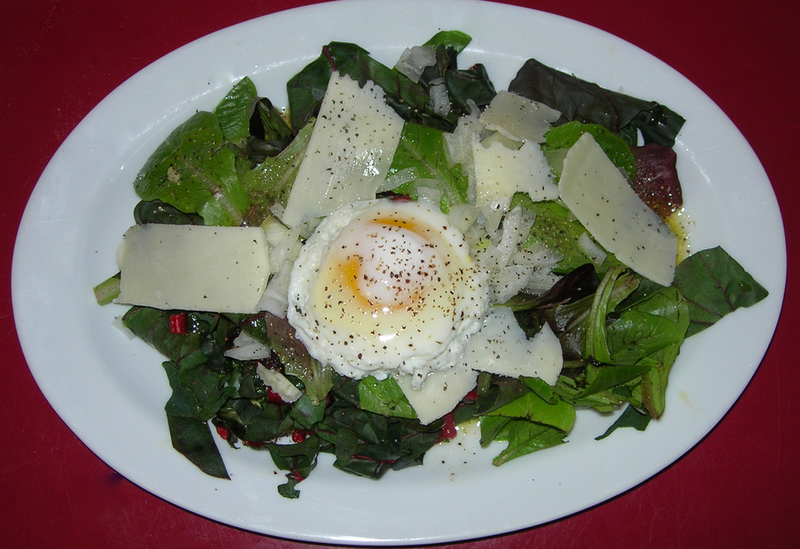 I sliced parmesan on top and laid the poached egg on the top of the salad. I poach eggs in a a sauce pan with a few inches of simmering water. I add a bit of vinegar to the water. Crack the egg in a small bowl first so you can slip it into the water rather than drop it. You can stir around the outside of the egg to encourage the white to sort of spin together using centrifugal force. Turn off the heat and put a lid on the pan and let rest for 4 minutes. Use a slotted spoon to remove it from the water without bringing water to ruin your salad. Break the yolk and stir the yolk into the salad, mixing it with the vinaigrette. It makes a creamy sort of vinaigrette.